Old Man Winter and Jack Frost are getting a later and later start to their usual frosty ways as the climate continues to warm. All regions of the continental U.S. have seen the frost-free season, defined as the stretch between the last below-32°F reading in the spring and the first in the fall, grow longer. According to the National Climate Assessment released earlier this year, the average length of that season has lengthened most dramatically in the Southwest, where its now 19 days longer when comparing the period of 1991-2012 to 1901-1960. The Pacific Northwest has seen its frost-free season lengthen by 16 days while the Northeast and Southeast have seen their warm seasons lengthen by 10 days and 6 days, respectively. Those are the regional averages. When you look at individual locations, there’s even more variation. 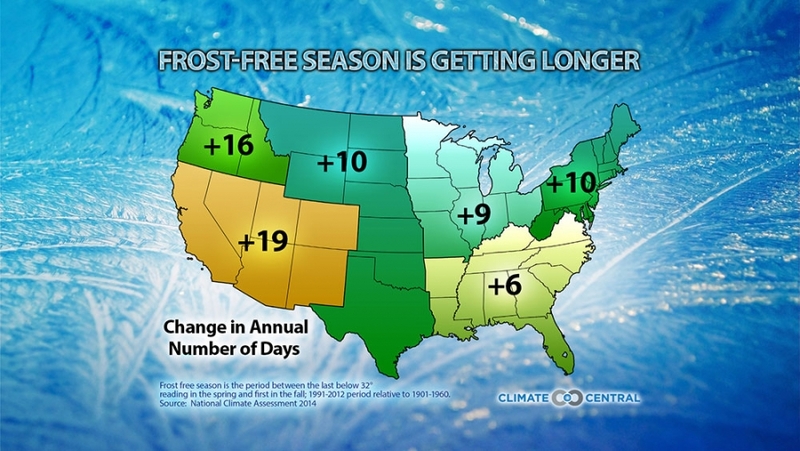 Some cities, including Albuquerque, N.M., Charleston, S.C., Columbus, Ga., Helena, Mont., and Houston have seen their frost-free season stretch dramatically. Others, including Chicago and Altoona, Pa., have barely changed at all. And still others, including Grand Junction, Colo., and Lincoln, Neb., have shorter frost-free seasons than they did back in 1970. See what has happened to your city since 1970 using the dropdown below. If greenhouse gas emissions continue to rise steeply, frost-free season will likely continue to lengthen. The most extreme changes are likely in the mountainous regions of the West, where the frost-free season could lengthen by 80 days or more by the end of the 21st century. That doesn’t mean you don’t you need to invest in nose protection from Jack Frost, you just might not need it as often.